It has been over 30 years since many research laboratories representing Japan have assembled in the Tsukuba Science City. Among the knowledge acquired in the area, many world-class research resources concerning nanotechnology have been accumulated there. The TIA-nano, Tsukuba Innovation Arena for nanotechnology, aimed Japan's largest nanotechnology research and education center established under the leadership of the National Institute of Advanced Industrial Science and Technology (AIST), the National Institute for Materials Science (NIMS), the University of Tsukuba, and the High Energy Accelerator Research Organization (KEK) with the support of Keidanren (Japan Business Federation), by integrating their capabilities in research and development. 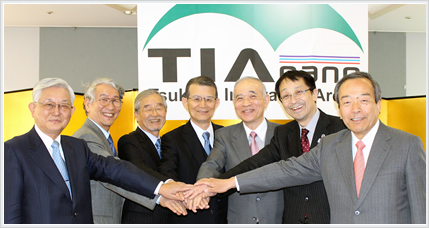 In April 2016, TIA-nano changed its name to TIA and has been advancing toward new research areas with its new member, the University of Tokyo. TIA exerts effort to promote research and development for speeding up the creation of new global businesses based on the strengths of science and technology of industry, academia, and government as well as the shared basic infrastructures. TIA offers up a platform to create a synergy among different categories of industry such as assembly, device, equipment and materials, etc., among industry, academia and government sectors, and among the various disciplinary domains of technology and science. TIA brings a knowledge-creation that satisfies participating researchers and companies of Japan and foreign countries, while promoting research and development and commercialization, by providing world-class user facility infrastructures. TIA, as a national center of nanotechnology, will cooperate with the expansion of the research network of industry, academia and government both locally and abroad. By being aware of the total optimization from a neutral and comprehensive view point, TIA promotes the development of collaborations that will become "win-win" relationship. During Phase 1 of TIA-nano from 2010 to 2014, we practiced open innovation and yielded many excellent research outcomes. With regard to the next five year period, from 2015 to 2019, we drew up specific plans for leading the reform of Japan’s innovation system in the form of "TIA-nano vision for 2015-2019." "creation of global-level intensive industry-academia-government cooperation bases"